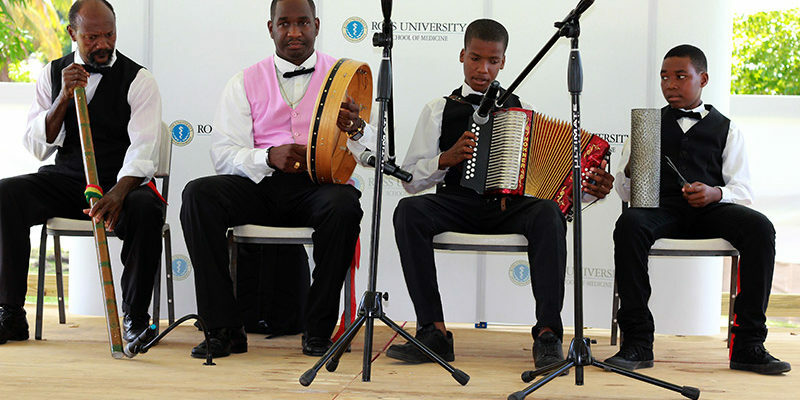 A range of musical instruments are used as part of independence celebrations here on the island of Dominica. These instruments are used for the creation of folk music. Cultural dances are performed to the rhythm of this island music. One type of dance is the bele. For bele one instrument is used. This is the Tambou Bele. The Tambou Bele has its origin in Africa. This drum is made from a dug out tree trunk and goat skin. The goat skin is stretched over one end of the hollow trunk and tightly tied around the circumference. From this instrument the pulse of the bele music is played. As the chantwelle (female vocalist) chants a folksong in a Call and Response manner. All other cultural dances are performed to the rhythm of what is called a jingping band. The jingping band comprises a number of instruments. One such instrument is the accordion. The accordion was introduced to the slaves by the Europeans. This instrument is the heart of the band. As its keys and pegs are pressed, as it is squeezed and wind goes across its brass reeds the harmonious melody coming from this instrument almost needs no accompaniment. The boom-boom is another key instrument of the jingping band. This is a wind instrument made from bamboo. The bamboo is hollow and the player simply blows into this and from this simple instrument a beautiful bass sound booms, calling all to attention. The grater, locally known as a gwaj, is just what the name says. The player uses a thin steel stick which is rubbed against the grater just as when grating. The scratching or grating sound which arises as a result is a somewhat eclectic yet beautiful one. Some graters contain beads on the inside of their steel casing, and serve as a shak-shak as well. The jingping band also comprises a shak-shak. This is usually a steel casing which contains beads derived from local plants. The casing of the shak-shak can also be made from the shell of a coconut once the husk and contest have been removed. The name shak-shak is an onomatopoeia. Thus it tells exactly of the sound it makes when shaken. The tambourine locally known as a tambal is another element of the jingping band. The tempo that comes from the hitting of this percussion instrument as well as the jingle from its zils is always a welcomed accompaniment as it adds much flavour to jingping music. This form of music which evolved on the slave plantations on the island of Dominica is still very much alive today and plays a central role in the Independence celebrations yearly. This music can be heard as it swarms every nook and crevice of every household during the months of October and November. It calls to mind an island’s tale- one which comprises the history of its people and their hopes for the future. Good info about instruments and jing ping band. Alaska, have ALS? We solve all the world problems. Fun to learn about other cultures.